Social and intellectual interactions are essential to children’s growth and learning. What teachers do in the classroom and how they do it needs to be informed by understanding each child’s individual differences in the context of what we know about child development. 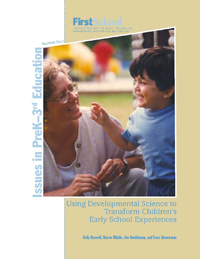 Four foundations for young children's development appear to underlie children's competence and predict success in school from pre-kindergarten through third grade —self-regulation, representation, memory, and attachment.